quebec teaching trip (part 2) | doberman pizza. We arrived in Victoriaville in the afternoon, to meet my good friend Geneviève, eight months pregnant with her second child (and first daughter), all smiles and cheery greetings. Nicole and Arlène stayed to chat a few minutes, then got back on the road for a return trip to Drummondville. We immediately set out to pick up Craig from work at Victoriaville’s Vision School, a trilingual primary/secondary private school. It’s housed in part of a big old seminary – part of which is still in use by the Frères du Sacré-Coeur (Brothers of the Sacred Heart), a local monastic community. 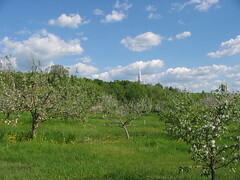 The Frères du Sacré-Coeur run an apple orchard – a fairly big one, too, that rolls down the Appalachian foothills in back of the seminary. 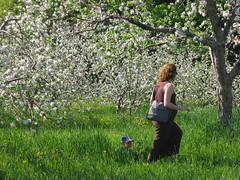 Geneviève and Craig had decided to take advantage of the day by taking family photos in the orchard. So Geneviève, Alex and I waited around for Craig to join us in the back, and we took pictures in the meantime. After an hour of waiting around for Craig, he finally showed up – after an hour of waiting for us in a different place. Oops. Miscommunication. After a few moments of sincere discussion and personal growth all around, we all settled down to work on fulfilling our stated purpose (and roll around a bit). 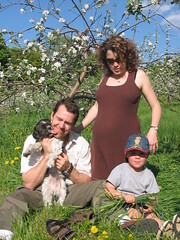 Craig, Geneviève, Alexandre (and Findo). After the photo shoot, we went back home and had dinner together. 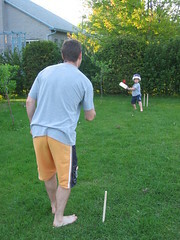 Afterwards, Craig and Alex decided to show me one of their favourite sports: cricket! Now, it wasn’t the first time Craig had shown me a sport – I became a great fan of Australian rules football once we watched a game together – but I had already seen cricket played, so I was a little skeptical (and puzzled). Leg before wicket, and all that. today was quieter than yesterday, I think, but we still managed to stir up a ruckus. 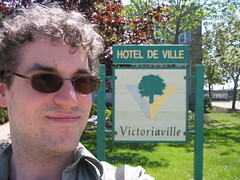 I’m actually in Victoriaville right now, staying with my good friends Geneviève and Craig… Continue reading ? The next day I woke up to what seemed like a million tongues licking my face and hands at great speed. It was just one, fortunately. I was also accosted by Spider-man (Alex), who insisted I help him fight evil-doers. So the day began. After seeing how stressed and busy Geneviève and Craig were, I resolved to help them out in any way I could. Geneviève had volunteered to sit at a booth selling raffle tickets in the morning, and she asked me to take her place so she could run errands. I gladly accepted, and drove out to the local Loblaws (where, incidentally, I used to work) to help set up. Rested and ready to sell tickets. During the day, I was accompanied by several people, including Constance (one of the Baha’is), who told me all sorts of stories about her life and goings-on in the Baha’i community. All in all, I stayed until about 2 PM – and I ended up selling more than my quota of tickets. Hot stuff! Maybe I am cut out for a job in sales. Anyway, I said my good-byes and started scooting around town, visiting familiar sites. 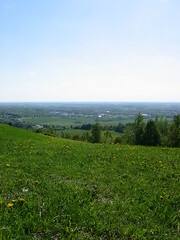 first few months of my stay in Victoriaville. her grandfather once lived there! 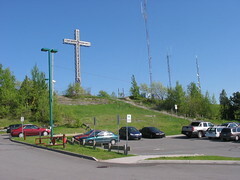 that they have on every mountain in Québec. I visited many different places – but one place I couldn’t miss was the home of Stéphane and Sylvie, a Baha’i couple I was close to when I lived in Victoriaville. 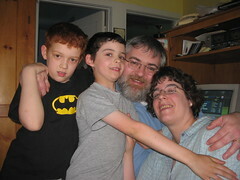 We were happy to see each other, and I was overjoyed to see them in good spirits and in good health. 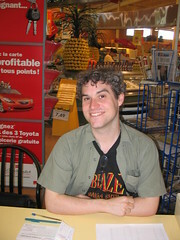 Stéphane gave me a signed copy of his new philosophical CD, “Philosophie pour le peuple”. It rocks. After all the visiting was done, I popped back in to have dinner with Craig and Geneviève, and Geneviève’s mom Monique, who dropped by in the afternoon. 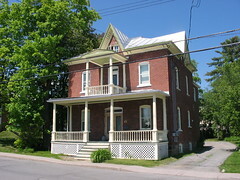 We had a nice dinner, and Monique shared news from the Baha’is of Québec City (where she lives). After dinner, Geneviève offered to put Alex to sleep while the rest of us went for a trip to the… driving range??? Craig gives Monique a crash course in golf. I won’t say too much about my introduction to golf, except that it was rife with laughter and buffoonery. It’s always nice being around friends and trying new things, no? I think the most that happened today was a good round of prayers, a little service to others, and some good visiting. That sounds good… Hopefully I’ll have the chance to attend Feast here on Sunday, and come back to Ottawa spiritually refreshed… Continue reading ?